Jona from Jona G. Pattern Co. and Stop Staring and Start Sewing! 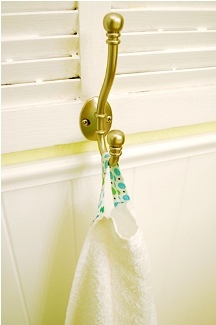 shows how to make a simple addition of a fabric tab to a towel to make it easier to hang from a hook. Hers are made from pretty fabric prints, but you could also use ribbon. Get the tutorial.